The MaxEmerge family of row-units have never seen a more versatile and efficient design until the MaxEmerge 5. The 5-family row-units improve productivity, increase uptime and lower the cost of ownership like never before. The MaxEmerge 5 row-unit was designed for improved performance and serviceability. Serviceability and changing crops has always been a focus of downtime and potential seed loss. MaxEmerge XP row-units (shown on the left) are designed with the meter and hopper as one component. The frame covers the meter so that it cannot be accessed. Cleanout of excess seed requires the operator to take the entire hopper off of the row-unit and to turn it upside down. The MaxEmerge 5 meter (shown on the right) is accessible without having to remove the box. The MaxEmerge 5 design allows large hoppers to be cleaned out the same as mini-hoppers, simply by opening the meter dome and catching the seed as it falls out. This improvement allows operators to change seed varieties easier and three times faster than it took them on the previous MaxEmerge XP units and provides more uptime during the tight planting window. The vacuum meter system gently pulls and holds individual seeds to the holes of the seed disk for population control and spacing accuracy, equaling better crop stands and profit. Vacuum seed meters can plant a wide variety of crops and seed types by simply changing seed disks and adjusting vacuum level. Vacuum seed meters are available for planters with MaxEmerge 5 row-units. The MaxEmerge 5 meter shape has also been redesigned for better seed flow. The mini-hopper design allows the planter to successfully operate on side hills up to 14 degrees. Both the MaxEmerge 5 vacuum meters are equipped with a heavy-duty hub spring and disk latching handle. The spring ensures the seed disk stays properly positioned when operating flat-style seed disks and higher vacuum levels. Proper seed disk positioning means repeatable seed singulation, time after time. 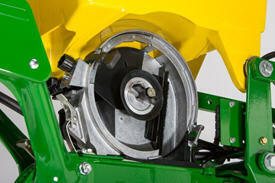 The disk-latching handle is designed for easy operation and effortless seed disk changeover. The hub is also machined to tight tolerances to further ensure alignment of metering components. The ProMax 40 Flat Disk is a flat-disk planting solution field-proven to work since 1991. The design of the ProMax 40 Flat Disk position allows seed to be released from the optimum position above the seed tube. The flush-face seed tube allows the seed to drop uninterrupted through the tube. The ProMax 40 Flat Disk utilizes flat holes and a higher vacuum level to ensure every hole is populated with a seed. A double eliminator gently removes multiple seeds at each hole for precise population control. 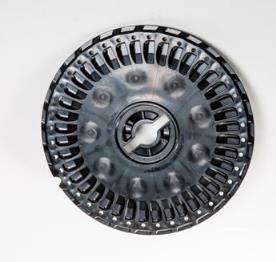 A knockout wheel makes certain that each hole is clear of any debris after the seed is released from the disk. 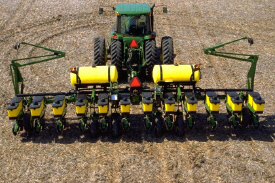 The unique cell disk design allows planting a variety of seed sizes without any additional parts or individual meter adjustments. Another advantage of cell-type seed disks is the lower vacuum requirement compared to flat-style seed disks. Lower vacuum levels mean less hydraulic demand from the tractor. Most planting conditions call for a flat disk, if you are limited in hydraulic capacity, cell disks are recommended. For difficult to singulate seeds, a flat seed disk and double eliminator is a viable alternative to traditional cell-type seed disks. By design, a flat seed disk requires higher levels of vacuum than a cell-type disk because there is no pocket or cell to hold the seed. The higher vacuum level will pull more than one seed to the holes in the seed disk. The double eliminator is set to cover a portion of the hole in the seed disk and is the mechanism to knock multiple seeds away as the disk rotates. Double eliminators are required with flat-type seed disks only and should not be used with cell-type seed disks. 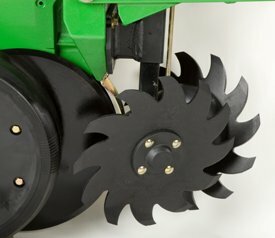 The knockout wheel is also recommended in conjunction with the double eliminator and flat seed disk to ensure seed is ejected from the disk. 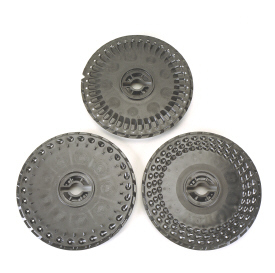 Flat and celled type seed metering disks are available to allow planting a wide variety of seed types. Mini-hopper row-units, which are used only with the CCS, are compatible only with crops that the CCS is approved to plant. NOTE: Due to small seed size and low planting populations, sugar beets can be planted with mini-hopper style meters by adding hopper extensions and not using the CCS tank. These hopper extensions can also be used for planting test plots. The vacuum seed meter is capable of operating at faster planting speeds than mechanical meters. However, planting accuracy will be influenced by seedbed conditions and the operating characteristics of the seed meter. Rough seedbeds and fast planting speeds (above 8.9 km/h [5.5 mph]) typically deteriorate seed placement accuracies when using seed tube technology. The chart illustrates the effect operating speed has on population when using the vacuum meter. The operating band (color area) illustrates how the vacuum meter performs in relation to the desired population (indicated by horizontal line). The width of the band is due to various sizes and shapes of seeds and planting rate variations. When operating on slopes above 15 degrees, increased or decreased population may result. To minimize this effect, reduce speed and consider using a flat style seed disk with increased vacuum level. One of the trademark capabilities of John Deere planters has always been the ability of the Tru-Vee openers to provide an ideal seed furrow. The thickness of the Tru-Vee opener blade is 3.5 mm (0.14 in.) this blade thickness will provide extended wear life. The MaxEmerge 5 row-unit also provides better Tru-Vee opener bearings for longer life. The double-row ball bearing provides up to three times the wear life as the single-row bearing. Also, to help with meter access of 56-L and 106-L (1.6-bu and 3-bu) hoppers the hopper shutoff feature was added. With the shutoff engaged, the meter cover can be opened without first having to remove all of the seeds from the hopper. Lever down, the seed flow is on, lever horizontal and the seed flow is off. There are significant changes to the MaxEmerge 5 mini-hopper. One update is the straight feed from the CCS hose to the mini-hopper to ensure a continuous free flow of seeds. This design change reduces the potential for plugging issues with larger seed size and the use of seed treatments. By drawing air from the CCS tank, the vacuum source is cleaner, preventing meter debris buildup. Ductile iron casting is a unique high-tech process that produces a single-piece row-unit shank this enables alignment from the seed trench to the closing wheel. The row-unit head is also designed using the ductile iron-casting process. The row-unit head provides the mating joints between the row-unit parallel arms and the row-unit shank. It is also the upper attaching point for the seed meter and seed hopper. Ductile iron casting of the row-unit shank and head assembly provides a row-unit that is 25 percent stronger than other competitive welded row-units. Rubber tire closing systems are used for most conventional, minimum-till, and no-till planting conditions. 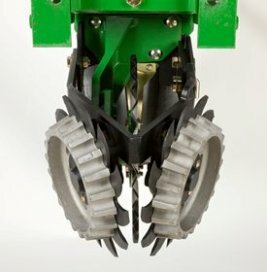 The spacing between the wheels is adjustable so the closing system can meet the needs of those who want to plant small seeds at shallow depths. The wheels can also be staggered fore and aft to enhance residue flow. Four levels of spring force are available and are easily set with the integrated T-handle adjustment. A lower force spring can be obtained from parts, if a lower amount of force is required. 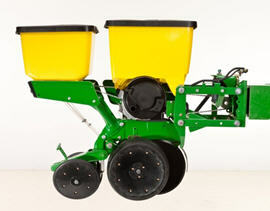 John Deere planters provide consistent seed depth control in all field conditions. Depth control is a function of the Tru-Vee openers, the downforce system, and the gauge wheel assembly. 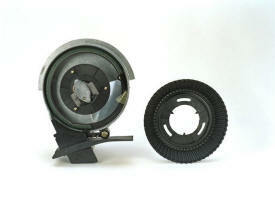 The gauge wheel itself is made of durable nylon composition with a concave profile. This profile gently firms the sides of the seed furrow, ensuring a well-defined trench. The shape reduces rocks and residue being picked up and thrown onto the drive chains and row-units, and helps to prevent rooster tailing of soil. The bolt-through design utilizes an open bearing in the gauge wheel that allows an attaching bolt to pass through the wheel to the threaded hole in the gauge wheel arm. This simple bolt-through design provides for a positive attachment of the gauge wheel to the gauge wheel arm and allows quick removal of the gauge wheel for service. Both the 1765 and 1765NT (narrow transport) feature a rugged 177.8-mm x 177.8-mm (7-in. x 7-in.) frame, wheel module lift system, and tire contact drive system. The 12Row30 flexible-frame model feature a two-section, center flexing frame design that flex 20 degrees up and 20 degrees down. The 1765 and 1765NT are recommended for conventional, mulch-till, and most no-till planting conditions. For 1765 and 1765NT Wing-Fold Planters that are operating less fertilizer or would require more frame weight for tough soil conditions, additional weight can be added to the center frame. A mounting bracket and six weights add approximately 272.2 kg (600 lb) to the planter. This weight prevents the frame from flexing up in the center when planting. Use AA41141 ballast bracket and six tractor front end weights. Attach the bracket with seven 19M7597 (M20x50) bolts and 14M7277 nuts. The 1765 and 1765NT Wing-Fold Planters have one hitch length available: 373.4 cm (147 in.) for planters used with a dual-wheel-equipped tractor. The long 373.8-cm (147-in.) 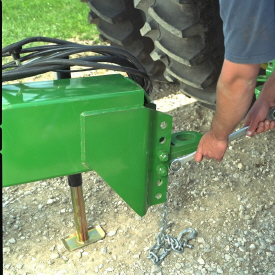 hitch options are available for all frame widths and can be equipped with either a clevis (code 2820) or ring (code 2810) style hitch link. Order the style of hitch link desired. 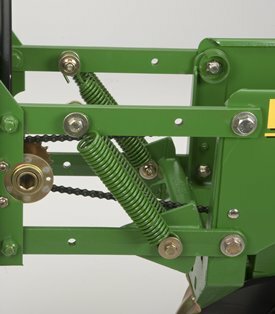 Hitches are adjustable, providing three hitch settings to match tractor drawbar height, resulting in level planter operation. Narrow Transport (NT) planters provide a compact transport width of only 3.7 m (12 ft). Wing folding of all 1765 Planters is hydraulically-controlled. The independent marker option and hydraulic-fold option are plumbed together using a diverter valve (code 868A) when both options are ordered (reduces selective control valve [SCV] requirements by one). Both the 1765 and 1765NT Planters can be equipped with a liquid fertilizer system. Eight-row configurations carry two fertilizer tanks totaling 1135.6 L (300 gal.) of capacity. The 1760 12Row30 model can handle 1703.4 L (450 gal.) of fertilizer in two tanks. The use of the single-disk, unit-mounted injection fertilizer opener or the frame-mounted, single-disk fertilizer opener makes the 1765 and 1765NT no-till capable. The 1765 equipped with the unit-mounted, double-disk fertilizer opener is not well suited for no-till applications and opener penetration may be limited by soil conditions. 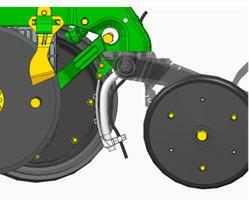 Frame-mounted, single-disk fertilizer opener is only compatible with 1765NT Planters. 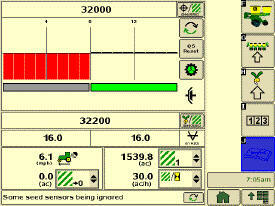 Integrated innovation is what operators will appreciate with the SeedStar 2 monitoring system and GreenStar™ 2 Display. An increasing number of acres combined with rising seed costs drive the need to easily understand planter functions and monitor performance. It is all about making every seed count and that is what SeedStar 2 delivers. The SeedStar 2 monitoring system is a full-feature, color, seed population monitor used in conjunction with the GreenStar family of displays. SeedStar 2 is compatible with the GreenStar 2 1800 and 2600 Displays, GreenStar 3 2630 Display, the Gen 4 4200 CommandCenter™ Display, the Gen 4 4600 CommandCenter Display, the 4240 Universal Display, and the 4640 Universal Display. SeedStar 2 is not compatible with the Gen 4 Extended Monitor. Conveniently, SeedStar 2 planting functions are fully integrated with the full spectrum of Precision Ag Technology applications—guidance, coverage maps, and field documentation can be shown all on one display. When a SeedStar 2 system is used on a planter, there is no need for a ComputerTrak™ monitor. All vital planting information is displayed in one central, easy-to-read location. SeedStar 2 is a user-friendly system that has retained all the valued features of SeedStar and incorporated the next generation of enhancements. For example, on-screen color indicators show drive engagement/disengagement status. In addition, three color planter-at-a-glance bars (black, orange, or red) visually inform the operator of row population status. 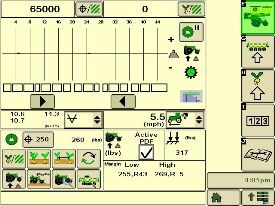 Not only does SeedStar 2 incorporate the use of color, it also utilizes an intuitive icon and folder based operator interface. Icons are easy to understand across many languages and reduce the need for text. Icons for planter main run page, planter setup, seed/crop setup, totals, and diagnostics are located in the soft-key region of the display. Setup is performed by selecting the appropriate icon and then choosing the tabs to enter/select information. 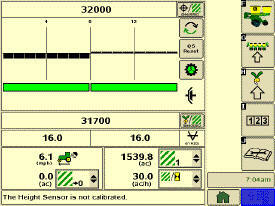 In addition, planter operational information is available within the SeedStar 2 monitor system. Such operational information includes population charts, seed disk vacuum settings, and setting recommendations for the piston pump liquid fertilizer system. All SeedStar 2 systems have the capability, through a single controller, to perform both the seed monitoring and variable rate drive functions. SeedStar 2 monitoring is required for VRD population control. Even though the planter may not be equipped with SeedStar 2 VRD, the SeedStar 2 monitoring system is available and will allow for future installation of VRD. GreenStar 2 display integration – eliminates the need to operate the GreenStar 2 2600 Display in the original GreenStar monitor mode or the use of dual displays. On-screen, color drive status – a quick glance at the display tells the operator if the half-width disconnect is engaged or disengaged. Three-color planter-at-a-glance population bar – a black bar indicates that population is close to target and within established limits; orange shows the population is above/below the alarm set point; and red signals the population is out of operating range or is not planting. 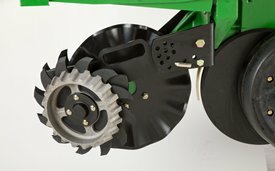 Three-piece, color VRD indicator – each piece of the VRD gear pie turns green when the wheel motion sensor is active, planter is lowered, and drives are engaged. 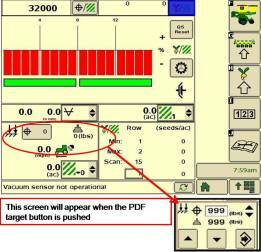 Planter at a glance – allows operator to view relative population levels of all rows on one screen. Automatic valve calibration – with the SeedStar VRD, this is now completed automatically. There is no longer a need to manually calibrate the hydraulic valves. Increased population updates – SeedStar will now update population levels once a second at planter start up then approximately once every three seconds. Mapping of actual seed rates – When combined with Field Doc™ system, actual and target seeding rates can now be mapped in APEX™ software. Automatic quick-start for SeedStar VRD – the operator no longer needs to press the quick-start button on end row turns to resume planting. Seed variable-rate drive provides the ultimate planting productivity by utilizing one, two, or three hydraulic motors (varies by model) to turn the seeding drive shaft. Hydraulic control of the seeding drive allows for on-the-go seeding rate changes right from the display mounted inside the tractor cab. Combine this seeding flexibility with the map-based planting option, and seeding rates adjust automatically based on the prescribed map. 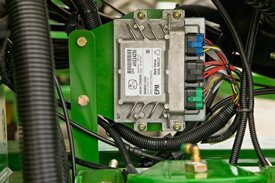 Single- or dual-motor systems for variable-rate drives are available for all John Deere planters except the 1785 Rigid Frame. 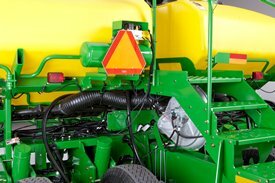 Variable-rate drive is available as a factory-installed option for all applicable planter models. 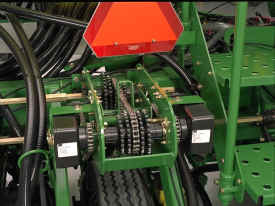 Single- or dual-motor systems are available as field-installed attachments for most planter models; however, a three-motor variable-rate drive field-installed attachment is not available. Seed variable-rate drive requires the SeedStar™ monitor and a radar input signal. Either tractor or planter radar may be used. Planter radar is ordered separately. NOTE: Peanut seed meter disks require the variable-drive transmission. Planter row-unit downforce is an important factor to ensure consistent and proper depth control. Downforce systems are used to keep the planting units from bouncing on rough seedbeds and to improve planter penetration in heavy residue and harder soil conditions. The amount of downforce required is determined by how the planter is equipped and the field conditions in which the planter is used. row-unit margin or extra weight cause by seed, tillage, or other attachments on the row-unit. Upforce springs will limit the maximum amount of downforce that can be place on a row-unit by the downforce system and should only be used in conditions were adequate and consistent depth control is easily maintained. Non-adjustable springs in the upforce or downforce position can also be used to counteract variances in row to row. When used in conjunction with the pneumatic downforce system, non-adjustable springs can be used to provide a more consistent row-unit margin on each row by compensating for inconsistencies such as tire tracks, different row-unit tillage attachments, and other various attachments. A single set of springs apply approximately 90 lb of upforce / downforce per row. Two sets of springs can be used for 180 lb of force per row. Adjustable, heavy-duty downforce can be used to apply 0 lb to 400 lb of downforce per row and has four settings: 0 lb, 125 lb, 250 lb, and 400 lb. The adjustable, heavy-duty downforce system can be used in all planting conditions and is compatible with all tillage attachments (recommended with unit-mounted coulter, row cleaners, and unit-mounted double-disk fertilizer openers in conservation planting conditions). NOTE: Compatible with all MaxEmerge™ Plus planters. Vacuum planters built prior to June 1992 require updated manifold brackets (A52970) to eliminate adjustment interference. 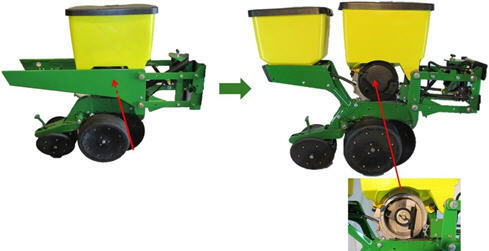 To add half-width row-unit drive disconnect to a planter, order the following attachment. 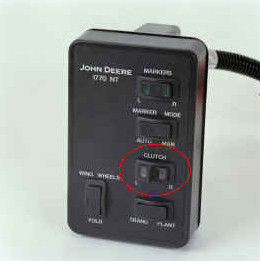 Allows shutting off half of the planter when planting point rows, headlands, etc., so as not to plant double seed. 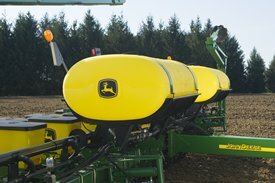 NOTE: When added to these planters that have SeedStar™ monitor, BA30921 frame control box is required. This box has the switch to activate the half-width disconnect system. 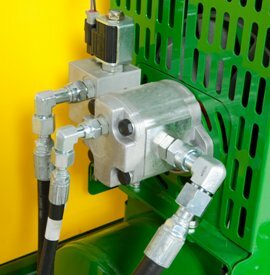 Achieve accurate and consistent liquid fertilizer rates across the planter with the John Deere block manifold delivery system. Attachments for field conversion (AFC) kits are available by planter model for planters not equipped with this system from the factory. Refer to the table below for ordering information. Models not listed below do not have an AFC kit available for liquid fertilizer from John Deere; most integral planter frames and Deere-Bauer planters. Source liquid fertilizer components for models not listed in table below through parts. NOTE: Attachments may or may not contain pump and tanks depending on planter model. Refer to the table to determine what attachments are needed for installing a complete liquid fertilizer system on each model. NOTE: Attachments contain parts down to the check valve only. Additional fittings will be required for complete installation to a particular fertilizer opener style or in-furrow delivery method. See Parts catalog to source additional fittings needed. 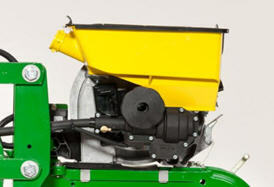 Row unit-mounted double-disk fertilizer openers are available for all John Deere planter models. The unit-mounted design disturbs less soil than frame-mounted openers. A 6-degree blade angle entirely opens the soil for fertilizer placement, and stainless fertilizer tubes and disk scrapers ensure product delivery. Fertilizer can be placed at seed depth or 1 in. below seed depth with the unit-mounted opener. The opener is positioned 4.45 cm (1-3/4 in. ), 5.08 cm (2 in. ), or 5.72 cm (2-1/4 in.) off the row and can be mounted to the left or right of seed furrow to balance planter draft. The unit-mounted double-disk fertilizer opener is recommended for conventional and reduced-till conditions only. This style fertilizer opener is only compatible with the row cleaner attachment identified below. No other unit-mounted tillage attachments are used in conjunction with the unit-mounted double-disk fertilizer opener. Requires adjustable heavy-duty down-force springs or the pneumatic down-force system. Compatible with row cleaner attachment only. NOTE: No longer available, order through Parts. Depending on the model, single-disk or double-disk frame-mounted fertilizer openers options are available to meet a wide range of operating conditions. The single-disk frame-mounted fertilizer opener is the most robust and versatile of the two frame-mounted options. One design mounts to rigid frame or folding planters and utilizes a steel upper arm for secure mounting. This style opener is shown in the right-hand picture above and has been available for a number of years. The second design of frame-mounted single-disk openers is strictly for 7-in. x 7-in. frames and is for use on the 1770NT, 1770NT CCSTM, and 1790 Planters (excluding the 24Row20). This design incorporates a longer curved upper casting and is shown in the left-hand picture above. 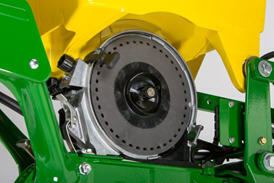 The frame-mounted, single-disk opener has the ability to be locked up in the raised position on 1790 Split-Row Planters. 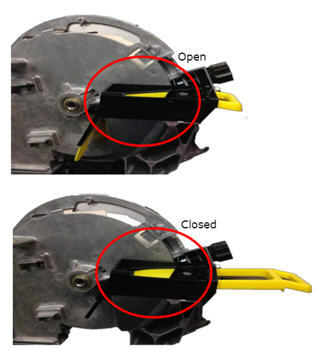 This eliminates excessive wear to the openers when planting soybeans with a 1790 and the openers are not utilized. There are two bundles required for updating 1790 Split-Row Planters. One bundle is used for the center frame section and the other bundle is for wing sections. 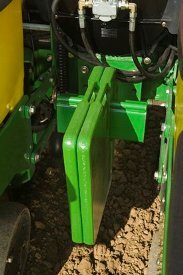 The frame-mounted, single-disk opener cannot be locked up in the raised position on 1770NT Planters due to frame tube and opener contact. The steel opener for rigid or folding planters (non-NT) can be raised somewhat by screwing up the spring assembly but cannot be completely raised from the soil. 1) Single-disk openers on 8Row30 1750 frames are limited to placement of 3 in. to 6 in. off the row on rows 4 and 5. 2) Single-disk opener is not recommended for loose, soft soil conditions unless equipped with cast spout. 3) Single-disk opener has optional heavy-duty spring A50733 (Parts) if more down force is needed in tough no-till conditions. 4) Double-disk opener is not compatible with frame-mounted coulter. Low-profile tanks and tank cradles only for use as ballast on 1760 and 1770 12Row30 Planter. Bundles include tanks and cradle only. Additional brackets and hardware are needed to complete the assembly. 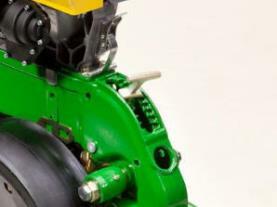 These parts vary by planter model. Order the needed parts from the table below. The covers for the tire rim used on the wheel module prevents rocks and other objects from becoming lodged between the rim/tire and the wheel module frame member. Lodged objects in this area could stop the wheel from rotating or tear out the tire valve stem, causing a flat tire. 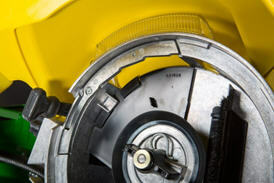 A U-shaped cutout in the wheel cover allows the tire pressure to be checked without removing the cover. The wheel cover is not compatible with the SeedStar™ variable-rate-drive option. 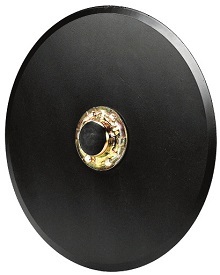 The wheel that has the motion sensor for the SeedStar variable-rate drive cannot be covered. NOTE: Wheel covers are also available as service parts. For 1760 or 1770 12Row30 Planter. 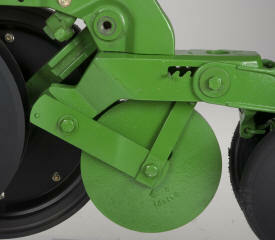 Rear-mount bracket permits mounting insecticide band spreader behind closing wheels when only insecticide is used. NOTES: Bracket is also available through Service Parts. Not compatible with seed packer wheel attachment or disk closing system. Use to convert 1760 Wing-Fold Planter from manual wing-folding system to a hydraulic folding system. Includes hydraulic fold cylinders, linkages, and hoses (less couplers). Requires separate tractor selective control valve (SCV). Controlling input costs and improving productivity are key producer requirements today. 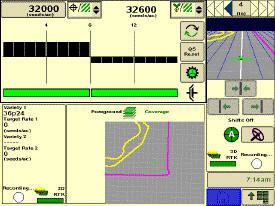 RowCommand is an effective, integrated John Deere solution designed to meet these intensifying needs. The RowCommand system manages seed output, reduces yield drag and improves harvest capabilities on select chain-driven MaxEmerge™ XP planters. NOTE: Chain drive RowCommand requires some modification to brackets in order to function with corn finger pickup meters. Information on the modifications needed is found in the following sales material. RowCommand controls seed output by incorporating individual, low-amperage clutches inside the chain-drive gearbox. Clutches are completely enclosed within the gearbox housing to protect them from the elements and harsh operating conditions. When power is supplied, either manually or through Swath Control Pro™, clutches disengage the seed meters and the seed flow stops. Controlling seed output at individual rows reduces overplanting in point rows and maximizes seed placement when entering/exiting headlands. 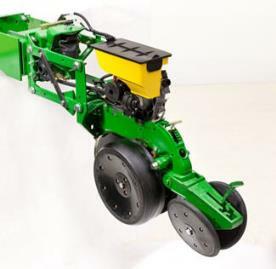 RowCommand is available as an attachment for field conversion (AFC) for the following chain-drive planter models equipped with pneumatic downforce systems. DB 44 24 row, 22 in. RowCommand is also compatible and designed to fit on those model year 2003 to 2008 (serial number range 700101 - 729999) planter models listed above that do not have CAN-based frame control or CAN-based half-width disconnect. For model year 2008 and earlier planters (serial number -729999 and below), the correct AFC bundle along with additional components (planter mainframe monitoring harness, SeedStar 2 controller, CAN adapter harness) are required for RowCommand operation. For all RowCommand eligible planters equipped with a mechanical transmission, a height sensor is required in order for RowCommand functionality. 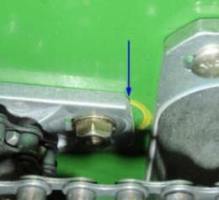 As seen in the picture to the left, chain interference may result when operating chain-drive RowCommand on planters equipped with short- and long- parallel arms and heavy-duty downforce springs. By design, power is only supplied to the clutch when a signal is received to stop planting. In a normal planting condition no power is supplied and the clutch is de-energized. Power for the RowCommand system is provided from the nine-pin ISO implement connector. 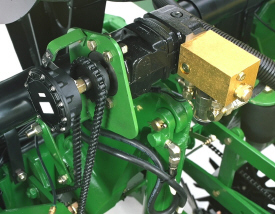 All late-model 8X00 and 9X00 Series John Deere Tractors equipped with the nine-pin ISO implement connector are capable of supplying ample power for system operation. Along with ample system power, a GreenStar™ 2 display and SeedStar™ 2 monitoring is required for operation and control interface. The GreenStar 2 display is where system setup, control settings, and manual control functions are performed. Due to the design characteristics of the chain drive RowCommand clutch, some modification to the corn finger pickup meter drive bracket is required. As seen in the picture to the left, some material needs to be removed from the front of the meter drive bracket in order for the chain drive RowCommand clutch to have sufficient space for installation. NOTE: Chain drive RowCommand requires some modification to brackets in order to function with corn finger pickup meters. Controlling input costs and improving productivity are key producer requirements today. 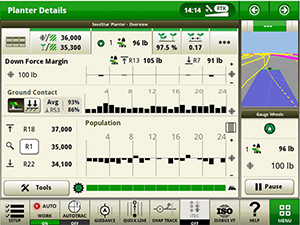 RowCommand is an effective, integrated John Deere solution designed to meet these intensifying needs. The RowCommand system manages seed output, reduces yield drag and improves harvest capabilities on all Pro-Shaft™-driven row-units—on both Pro-Series XP and MaxEmerge™ XP planter. 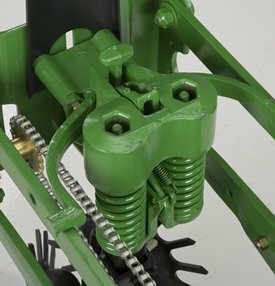 RowCommand controls seed output by incorporating individual, low-amperage clutches inside the Pro-Shaft drive gearbox. Clutches are completely enclosed within the gearbox housing to protect them from the elements and harsh operating conditions. When power is supplied, either manually or through John Deere Section Control, clutches disengage the seed meters and the seed flow stops. Controlling seed output at individual rows reduces overplanting in point rows and maximizes seed placement when entering/exiting headlands. RowCommand is available as a factory-installed option or as an attachment for field conversion (AFC) attachment. 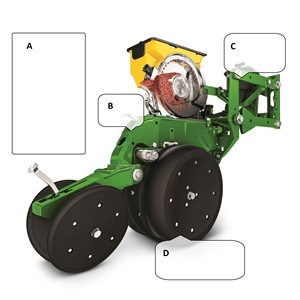 The RowCommand system is designed for the entire list of planter models as follows. 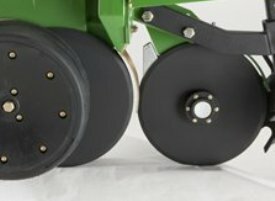 NOTE: Factory installation of RowCommand will replace one-half or one-third width disconnect clutch components on the planter drive. DB 60 36Row20 in. or 47Row15 in. DB 80 32Row30 in. or 48Row20 in. RowCommand is also compatible and designed to fit on model year 2003 to 2008 (serial number range 700101 - 729999) planter models listed above that do not have CAN-based frame control or CAN-based half-width disconnect. For model year 2008 and earlier planters (serial number -729999 and below), the correct AFC bundle attachment along with additional components (planter mainframe monitoring harness, SeedStar™ 2 or SeedStar XP controller, CAN adapter harness) are required for RowCommand operation. NOTE: RowCommand is compatible on MaxEmerge XP row-units with vacuum and corn-finger pickup meters. However, for Pro-Series XP™ row-units, RowCommand is compatible on vacuum meters only and is not compatible on corn-finger pickup meters. There is a select group of planters that might have Pro-Series XP row-units with corn-finger pickup meters in which RowCommand will not be compatible. RowCommand is a simple and efficient means to control individual row planting through the use of low-voltage electric clutches. Each clutch, when activated, consumes no more than 0.5 amp. Along with ample system power, a GreenStar™ 2 Display and SeedStar 2 or SeedStar XP monitoring is required for operation and control interface. The GreenStar 2 Display is where system setup, control settings, and manual control functions are performed. These items can be ordered to convert planter from plate or plateless meters to vacuum meter system. NOTE: Order seed metering disks from ''Attachments'' section. 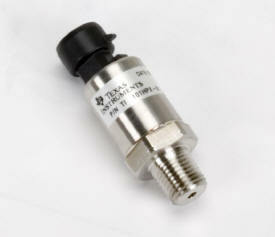 BA26722 vacuum level sensor recommended if planter is equipped with SeedStarTM monitoring system. The radial bean meter is a mechanical meter to be used in conjunction with the finger pickup meter. Soybeans are the only crop compatible with the radial meter. Those who are currently using the feed cup or competitive brush meters for soybeans and who desire improved spacing and population control should consider the radial meter. A seed bowl mounts to the meter housing and rotates around the meter housing, singulating seeds for enhanced spacing. The seed bowl clearance is adjusted in relationship to the meter housing as seed size is changed. Seeds, ranging from 2000 seeds per lb to 4500 seeds per lb, are planted with the one seed bowl. Brushes mounted on the meter housing act as doubles eliminators and cleaners for the seed bowl. 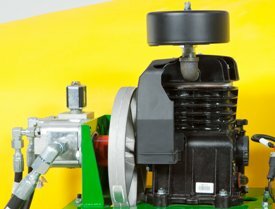 Meter utilizes a sprocket-type wheel to better eliminate any beans being stuck in the seed bowl and to offer greater wear characteristics. Meter component life is at least 650 acres per row, prior to wear appearing, for minimum maintenance. 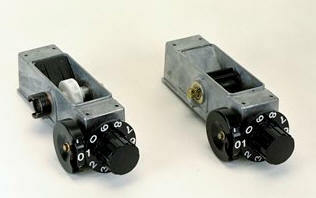 The radial bean meter is also available for MaxEmerge™ planters by ordering AA45061 from Parts. 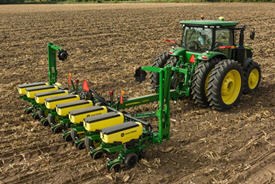 John Deere active pneumatic downforce makes getting the planting accuracy desired even easier. A hydraulically driven compressor works with the SeedStar™ 3 HP system and SeedStar XP system to automate downforce control. Just set the row-unit target margin value and the active pneumatic downforce system works automatically to make sure the planter maintains this value-achieving precise soil penetration, and consistent planting depth without sidewall soil compaction. This frees the operator from constantly making manual downforce adjustments as conditions change. It also allows the operator to focus on all the other planting factors that drive up yields, like seed singulation and spacing. This system also offers a split rank control feature for split-row planters. 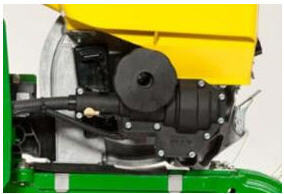 On top of actively controlling the pneumatic downforce system across the planter, John Deere active downforce will control the front and rear rows of split-row planter independently. This compensates for differing downforce requirements between the ranks and will help maintain an accurate planting depth and consistent margin across all the rows. 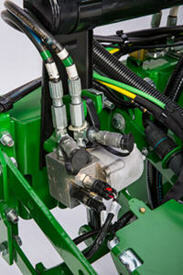 Single-rank planters such as the 1770NT, 1790 24Row20, and Deere Bauer Planters except for the DB60 47Row15 require a compressor assembly and hydraulic hose kit to complete the field conversion. The 1790 and DB60 47Row15 Split-Row Planters require the compressor with split rank control, hydraulic hose kit, and the PDF hose kit for split rank control. Additional components maybe needed depending on model year. Designed to improve seed emergence in particularly difficult soil conditions that severely bake and crust after planting. These conditions are found primarily in irrigated cotton planting areas of the southwestern United States. 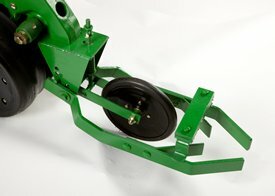 A seed packer wheel precedes the drag and pushes seed down into the moist soil. Drag brings loose soil into seed furrow without compaction. Without the typical closing compaction, the covering soil acts like a mulch, reducing the tendency to crust for improved seed emergence. Only for use in fields that are relatively level and free of residue and clods that could cause plugging. NOTE: Not compatible with leveling chains, tine tooth incorporators, rear-mounted granular insecticide or herbicide attachments, seed packer wheel or insecticide diffusers. Rubber tire wheels are recommended for most conventional, minimum-till, and no-till planting conditions. Multiple levels of spring force are available, and are easily set with the integrated T-handle adjustment. 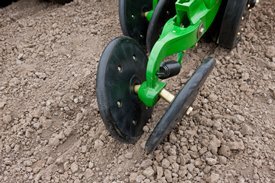 Cast-iron wheels are recommended for use in tough soil conditions where additional closing force is required. 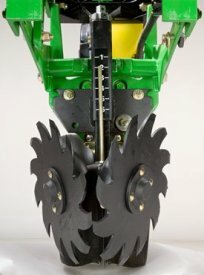 The disk closing system is recommended for very shallow planting depths. Two small disks are used to gently firm soil around the seed. These disks are followed by a wide packer wheel to gently pack the soil surface. This system is not recommended for use in high residue applications. 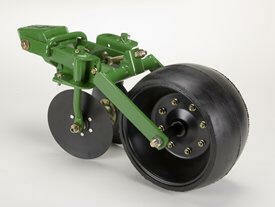 To convert planters equipped with rubber-tire closing wheels to cast-iron closing wheels. May be used where rubber-tire closing wheels do not adequately close seed trench. For individual cast wheels only, order AA34350 from Service Parts. NOTE: Cast-iron closing wheels are not recommended in conventional tilled ground. 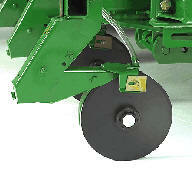 Converts planters equipped with cast-iron closing wheels to rubber-tire closing wheels. Used in all types of planting conditions. For individual rubber-tire closing wheels only, order AA39968 from Service Parts. Limited by their ability to close seed trench in extreme soil conditions. NOTE: For wheels only, order AA39968 from Parts. Used in tilled soil to move dry soil away from the planting unit path to plant in moist soil. NOTE: Cannot be used on row spacing of less than 30 in. Furrowers are used in conservation tillage conditions to sweep trash and a small volume of soil to the sides to clear a path for the planting unit. Furrowers have alternating right and left-hand leading blade to assure straight planter draft. Effectiveness of furrowers is limited by the trash-cutting ability of the attachment. Available with two 13-in. solid blades or with a notched blade in the leading position. Leading notched blade provides improved cutting action. The blade mounting bracket is adjustable to change the contact angle for improved sweeping action. Depth is easily adjustable. Convenient pointer and scale give easy-to-read reference point. Furrowers are not compatible with unit or frame-mounted coulters. Finger pickup meters continue to be a reliable metering system for corn by providing consistent seed spacing and population control in mixed seed varieties. Recent changes to the finger, including shortening and adjusting the angle of the flag on the finger, have further increased the accuracy of our finger pickup seed meter. The finger pickup meter provides consistent seed spacing and population control when planting corn. It also has good performance in metering confectionery (large) sunflower seeds. The meter handles all normal sizes of U.S. seed corn (except popcorn) and larger sizes of No. 2 sunflower seed. For smaller sizes of No. 2 and all No. 3 and No. 4 sunflower seeds, order sunflower finger assembly from (Parts). NOTE: The size of No. 2 sunflower seed varies considerably among suppliers. When planting the larger size of No. 2 sunflower seeds, as well as the No. 1 seed, BA30041 corn finger pickup meter is recommended. A37177 finger is available to improve performance of finger pickup meter for No. 2 and smaller seed. Finger can be installed in existing holder or a new finger-and-holder assembly (AA31262) can be ordered through Parts. The feed cup is an economical meter designed for volumetric seed metering. Seeds are not singulated in this style of metering system. Therefore, this type of volumetric meter will not provide the most accurate seed spacing. Feed cup meter planting accuracy will be influenced by seedbed conditions and the operating characteristics of the seed meter. Rough seedbeds and fast planting speeds typically deteriorate seed placement accuracy. Feed cups are available for soybeans, edible beans, acid-delinted cotton, and regular or low-rate sorghum. 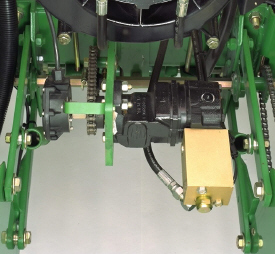 The single-disk, unit-mounted injection opener is available for many of the integral planter models along with some of the drawn planter models. It is capable of working in all soil conditions. However, it is best suited for no-till conditions in which the double-disk opener has limited residue cutting and penetration capabilities. This system incorporates a 16-in. 50-flute blade for good cutting and penetration capabilities. The coulter blade runs 2 in. off the seed furrow. This is an injection fertilizer opener system. The coulter blade opens the soil; a 1/2-in. tube and nozzle assembly injects the fertilizer into the trench. Application rates are 2.4 U.S. gal per acre to 37.6 U.S. gal per acre. This single-disk opener is not compatible with any other row tillage or row-unit-mounted attachment. When paired with a unit-mounted coulter, the floating combo row cleaner offers the ultimate solution for managing tough residue and soil conditions. The row cleaner clears the way of debris, and the coulter penetrates tough soil, opening the furrow for the row unit opener blades. The floating ability of the row cleaner allows the unit to adapt to varying terrain independently of the row unit. The floating row cleaner allows a row cleaner to be used in conjunction with a unit-mounted coulter.This combination is often desired in heavy residue loads and tough reduced tillage planting conditions. The floating row cleaner features the SharkTooth® wheel. The beveled, sharpened edge of the teeth on the SharkTooth aggressively cuts flat and standing residue in the path of the row unit. The curved tooth design sweeps a clear path for the unit mounted coulter and opener blades, and resists residue buildup. When used with the unit mounted coulter, the wheels are run side-by-side. They may be operated with one wheel forward if desired, by simply relocating the wheels to existing holes on the row cleaner bracket. The wheel bearings of the floating row cleaner are sealed and require no regular maintenance. Cast aluminum depth gauge bands are standard equipment on the floating row cleaner. These durable bands are mounted directly to the row cleaner wheel, and aid the row cleaner in maintaining a consistent operating depth over varying terrain. The depth gauge bands also add weight to the row cleaner, aiding penetration in tough conditions. The depth gauge bands may be removed if desired. The floating row cleaner is designed with maximum terrain following flexibility in mind. The pin adjustment has multiple settings available in 1/4-in. increments. The primary method of operating is to limit the maximum depth of operation, and allow the row cleaner to float up when necessary. This is accomplished by placing the adjustment pin below the floating bracket, limiting downward travel, but permitting upward travel. It is also possible to set the row unit in a manner allowing full float. Simply place the pin in the lowest setting, allowing the depth gauge bands to determine the operating depth up and down. In some conditions, it may be desirable to pin the unit in a fixed position. This may be accomplished by simply pinning through the floating arm, fixing the row cleaner arm to the row unit and allowing the row unit to control operating depth. SharkTooth® is a U.S.-registered trademark of Yetter Manufacturing. Not compatible with any row spacing less than 30 inches, except the 1790 Split-Row Planter. Not compatible with Deere/Bauer or Deere/Orthman planters. 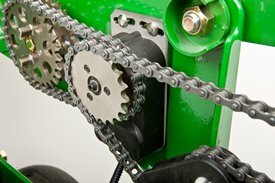 Drive wheel chain shields are recommended for use with row cleaner attachments. 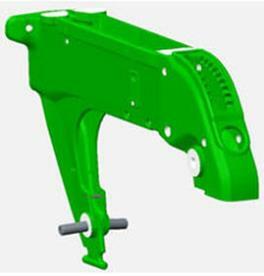 For available long parallel arm attachments for field conversion, please click here. Use of long parallel arms is recommended, but not required, when using the floating row cleaner on 1770 Flex Planters in conjunction with frame-mounted fertilizer openers. Use of long parallel arms on these machines will maximize the distance between the fertilizer openers and the row cleaner, preventing interference and maximizing residue flow. Other row cleaner designs are available for use without a unit mounted coulter, or for use with unit-mounted double disk fertilizer openers. Use of row cleaners and unit-mounted coulters is not recommended when surface application pre-plant herbicide is used prior to planting. when using pre-plant incorporated herbicide, the row cleaner should be adjusted to minimize soil disturbance so as not to reduce the effectiveness of the incorporated herbicide. Designed to offer full flexibility to follow ground contours and effectively mix soil and chemicals. Also levels soil and leaves it loose to further reduce the chance for crusting or erosion. Tooth angle and penetration are easily adjusted for more or less aggressive action depending on the soil texture. NOTE: Not compatible with disk closing system or seed packer wheel attachment. Permits addition of herbicide to the planting unit already equipped with insecticide for dual insecticide/herbicide applications. Includes herbicide meter, chemical hopper divider, and rear spreader. Does not include chemical hopper. Includes granular insecticide (with components for seed furrow placement and front or rear band spreader capability) plus herbicide with rear-mounted spreader. Insecticide can be placed ahead of closing wheels (in-furrow or banded) or behind closing wheels (banded). Hopper, hopper divider, drive, and meters are included. Windshield is available to decrease wind effect on distribution pattern (order separately). In order to add dry chemical (herbicide) capability to planters equipped with MaxEmerge™ row units, the installation of the dry chemical hopper, meter, drive chains, rear-mounted spreader, and related attachment hardware are needed. 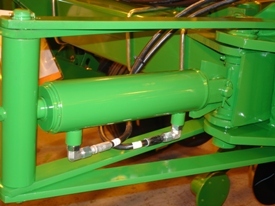 As seen fully assembled in the picture to the left, the herbicide spreader is equipped with a series of baffles that distribute the dry granules on the ground in a band approximately 14 in. wide. Along with the spreader assembly, a windshield is available to decrease the effect wind has on distribution pattern (order BA25340 separately). NOTE: Not compatible with the seed packer wheel attachment or disk closing system. Includes hopper, meter and both seed furrow placement and front band spreader components. Granular chemical meters have a meter wheel for applications of up to 8 oz. per 1000 ft of row. For higher application rates, order the fluted roller for the meter (A50863) from Parts. When band spreader is used, insecticide is placed on ground in a band approximately 7-in. wide ahead or behind closing wheels. Available with regular or closed-chemical hopper lids. 1. 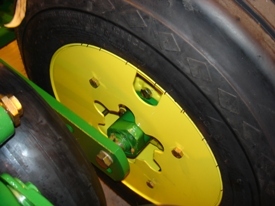 Using rear-mount bracket (Code 9450/BA24528) allows using band spreader behind closing wheels. 2. Not compatible with seed packer wheel attachment or disk closing system. 3. Not compatible with 3.0 bushel seed hoppers. Hose guide is a flexible material and is black in production but shown in white in these pictures. 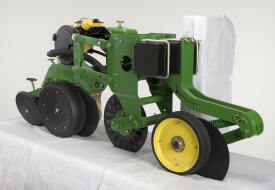 The in-furrow liquid fertilizer and dry insecticide row-unit attachment kit will be offered as an AFC only. It is compatible with MaxEmerge™ 5 row-units, ExactEmerge™ row-units and older XP row-units with in-furrow fertilizer or with granular insecticide or with both. 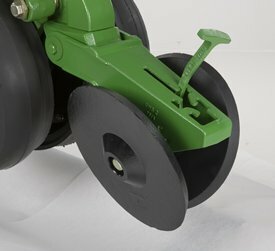 This attachment is designed to work with the 8-mm liquid in-furrow fertilizer hose and 1.9-cm (3/4-in.) dry insecticide hose. It can be configured in three different ways. This BA32912 kit is able to be installed to the closing system with the existing hardware using one bolt. 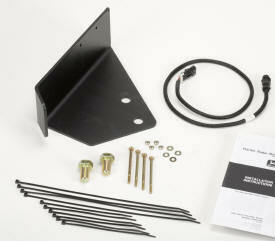 This allows for a quick install and the tab on the front of the bracket keeps the orientation. No need to remove the gauge wheels or opener blades. The hose or hoses can be routed through the hole in the shank casting and closing wheel. Other items needed based on number of kits order. Most dealerships already have these supplies stocked. A94657 is 200 m (656 ft) of hoses and would complete approximately 218 rows. Applies pre-emerge liquid herbicide behind planting units. ''Even'' type spray tips are recommended for spraying in bands from 7 to 17 in. with the nozzle in the lower position (shown). The support tube may be inverted, placing the nozzle in the ''up'' position. Coverage in this position is from 50 to 90 in. in width when using flood type spray tips. This type of coverage is not recommended for less than 1/2 gallon per minute flow. Check valves, nozzle bodies, and quick-attach nozzle caps are included for changing tips fast and easy without the use of tools. 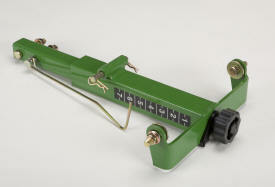 Also, this attachment for field conversion includes the distribution manifolds and hoses. 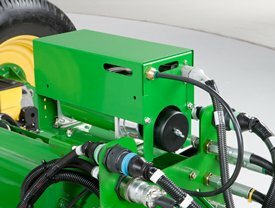 This attachment for field conversion does not include nozzle tips and strainers; see SprayMaster™ sprayer parts and accessories. Also, this attachment for field conversion does not include but requires (customer-supplied) tractor-mounted controls, tanks, pump and filters. 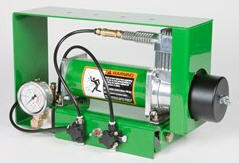 The pressure gauge allows monitoring of the liquid pressure in the fertilizer high-pressure manifold. 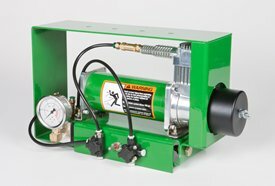 Pressure gauge is compatible with all piston pump applications, both current and noncurrent. By being able to monitor the pressure, the operator will know when there is a plugged orifice or strainer in the system. NOTE: Not for planters with SeedStarTM monitoring systems. Working pressure should be from 20 psi to 70 psi in the high-pressure manifold. If pressure exceeds 70 psi, inspect and clean the 50-mesh strainer and orifice in the manifold. If the strainer and orifice are not plugged, replace the orifice with the next-larger-sized orifice. 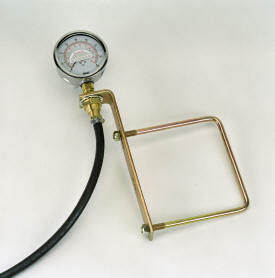 Use the largest orifice possible to operate within the 20-psi to 70-psi pressure range. Two orifices, #43 and #59, are provided with the piston pump. Four other orifices, #31, #47, #78, and #95, are available through Parts. Proper filtering of the liquid fertilizer is important to prevent obstruction of the orifices and damage to the system. Clean and inspect the 80-mesh strainer in the line at the bottom of the pump. Other strainers, 50-mesh and 24-mesh, are available through Parts. To adapt 1730 and 1780 Rigid Planters liquid herbicide attachment for 15- through 20-in. row spacing applications. Contains manifold for up to eight rows and hose connector to pump. Does not include manifold distribution parts for 1/4-in. hose and spray nozzles. Does not include any hose pump or control. Order hose through Parts. Used to attach pre-emerge spray nozzles behind the planting units. Includes nozzle body but does not include the hoses or nozzle tips. To adapt 1730 and 1780 Rigid Planters liquid herbicide attachment for 15- through 20-in. row spacing applications. Improved pneumatic downforce systems are available as a factory-installed option on all planters and as a field conversion bundle for all MaxEmerge™ 5, MaxEmerge XP, MaxEmerge Plus, and MaxEmerge 2 planters. All pneumatic downforce field conversion bundles contain upgraded components to reflect pneumatic system upgrades for model year 2011. Row-unit downforce is infinitely variable from 0 lb to 400 lb. (0 kg to 181.4 kg). A gauge and/or display provides a reading as to how much downforce the system is providing. The downforce is constant at all times during operation. On all model year 2011 and newer 1775NT, 1775NT CCS™, 1795, and DB Series Planters, the pneumatic downforce adjustment is displayed within the GreenStar™ 2 Display as base equipment. However, when converting a model year 2010 and older 1770NT, 1770NT CCS, 1790, and DB Series Planter, the air compressor assembly and gauge need to be mounted within the tractor cab, similar to factory-installed pneumatic downforce equipment configurations for that model year. Each row-unit has a single air bag located between the parallel arms. The air bag is hooked in parallel so air can be added or released from all rows at once from one location. 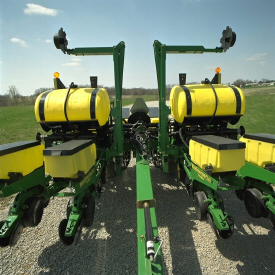 Split-row planters have the corn row-units and soybean rows plumbed separately, so the pressure can be removed from the bean rows when planting corn. MaxEmerge 2 row-units with long parallel arms must have the arms changed to current production parallel arms. This ensures the correct hole pattern for pneumatic downforce. Refer to the attachment description to order the appropriate bundle for the frame size. NOTE: Row-units with long parallel arms require A54544 spacer block if not so equipped (Service Parts). 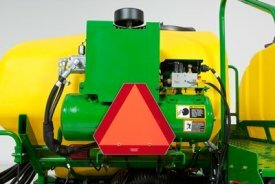 An air compressor, located either in the tractor cab or on the frame, pumps up the system. Integral planter models ordered with pneumatic downforce from the factory have in-cab mounting as base equipment. 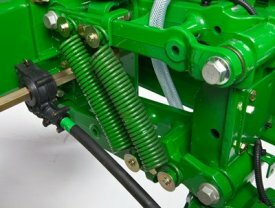 For drawn planter models, the air compressor assembly is mounted onto the planter frame for model year 2011. Prior to model year 2011, the 1775NT, 1775NT CCS™, 1795, and DB Series Planters have the air compressor mounted within the tractor cab from the factory. Valves located on the compressor allow bleed-off of the system. Interplant rows are shut off entirely when those rows are locked up. Field conversion bundles have been established for upgrading pneumatic downforce systems. 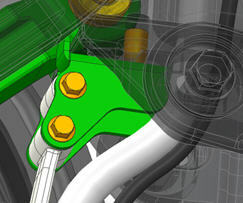 With the bundle structure, order the individual components for a pneumatic downforce system. There are individual bundles for the air compressor, the row-unit downforce assembly, and a hose kit. 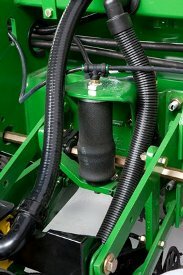 Each planter requires one air-compressor bundle, a number of row-unit downforce assemblies equal to the number of rows on the planter, and a hose kit for each 12 rows being equipped with pneumatic downforce. There are four different row-unit downforce assembly attachments. The selection of the row-unit downforce assemblies is based on the type of meter drive, chain or Pro-Shaft™, and type of parallel arms being utilized, regular or long, on the row-units. The planter radar is for SeedStarTM and ComputerTrakTM systems. The SeedStar and ComputerTrak 250, 350, and 450 monitor systems require radar. Includes pointer, scale, and large easy-to-use adjustment knob for convenient adjustment to desired working depth. Required with tine tooth tillage, conservation furrower, and V-wing attachments when ordered as extra equipment. 1) Not compatible with unit- or frame-mounted coulters or heavy-duty parallel arms. 2) For MaxEmerge™ 2 planters built prior to June 1991, order A52092 cast lower parallel arm. Recommended for extremely sticky soils where even rotary scrapers have problems keeping Tru-VeeTM disks clean. Scraper blades are heat treated for added wear. NOTE: Not compatible with any row-unit tillage attachments except conservation furrowers, unit-mounted coulter, and unit-mounted row cleaner. The screw-adjust, unit-mounted row cleaner is mounted directly to the face plate of the row unit, placing the ground-engaging components just in front of the row unit opener blades and depth gauge wheels. 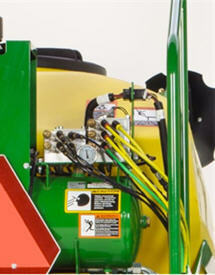 This close proximity allows the gauge wheels to control the depth of the row cleaner as well as the row unit. 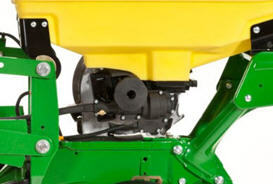 This compact design also allows greater compatibility with fertilizer openers and other planter attachments. The unit-mounted row cleaner features the SharkTooth® wheel. The beveled, sharpened edge of the teeth on the SharkTooth aggressively cut tough residue that lies in the path of the row unit. The curved-tooth design sweeps a clear path for the openers and resists residue buildup. The wheels are arranged in a staggered fashion with one wheel leading the other, ensuring complete clearing of the row unit path. The bearing on the SharkTooth wheel is sealed and requires no regular maintenance. Bearing shields are used between the wheel and the mount bracket to prevent residue wrapping and buildup around the bearing housing. The unit-mounted row cleaner offers a convenient screw adjustment feature for changing the depth setting. The Acme screw is enclosed within the structure of the mounting bracket, providing protection from the elements. The adjustment knob for the screw adjustment is accessible from the top of the parallel arms. The knob can be adjusted by hand, or by using a socket. The adjustment is detented in 1/16-in. increments, allowing for quick, easily repeatable adjustments across all rows of the planter. An indicator rod and scale on the front of the row cleaner bracket indicate the current setting. If a condition is encountered where use of the row cleaner is not desired, it can be set so that the wheels do not engage the soil surface. Use of row cleaners is not recommended when surface application pre-plant herbicide is used prior to planting. When using pre-plant incorporated herbicide, the row cleaner should be adjusted to minimize soil disturbance so as not to reduce the effectiveness of the incorporated herbicide. Drive chain shields are recommended for use with row cleaner attachments. Not compatible with use of frame-mounted coulter. Not compatible with any row spacing less than 30 in. For 1790 12/23, 12/24, 16/31, and 16/32 row machines, unit-mounted row cleaners recommended provided on the front rank of row units only. For DB60 47R15 machines, unit-mounted row cleaners are recommended on the 24 row units with short parallel arms only. Other row cleaner designs are available for compatibility with unit-mounted coulters and row unit-mounted double-disk fertilizer openers. Bundle is not compatible with long parallel arms. If purchasing for use on a long parallel arm machine, a separate bracket must be ordered from Service Parts. 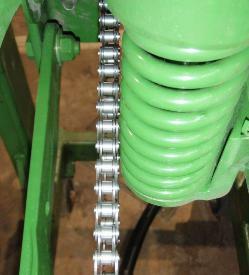 Drive wheel chain shields are not required on 1760, 1770 12Row30 (non-NT), or 1780 Front-Fold Planters. Drive wheel chain shields are required on other compatible models. Order BA25697 for the 1750 Standard Planter. Order BA24093 for all planters except the 1750 Standard. For use when planting cotton in special growing conditions found primarily in southwestern United States. Some particularly difficult soil types found in these areas are susceptible to severe ''baking and crusting'' if sufficient wind, soil moisture, temperature and sunlight conditions are present. In these situations, it is important to achieve adequate seed/soil contact while minimizing soil surface compaction. Includes a wheel that runs ahead of the closing wheels to press the cotton seed into the bottom of the furrow. Using the packer wheel enables the regular closing wheels to be used with a minimum force setting. Reduced tillage conditions (typical corn-belt conditions). Attachments for field conversion are available for complete seed hoppers and lids. Includes plateless and vacuum plastic 1.6 or 3.0 bushel seed hopper and lid. 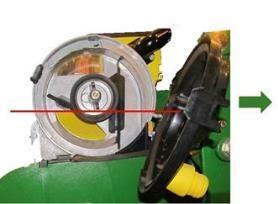 Seed meter, drive, and latch must be ordered separately if needed. These are for MaxEmerge™ XP rows only. 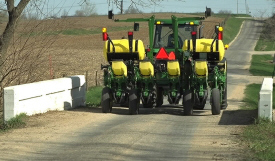 Adapts planter to plant in reduced tillage conditions. Nodular iron coulter arm mounts directly to planting unit shank to utilize full unit weight for penetration. Unit gauge wheels provide depth control. 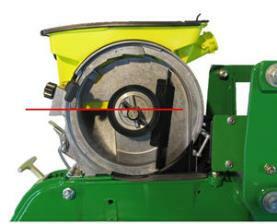 Coulter blade is positioned directly ahead of Tru-Vee™ opener to ensure accurate tillage in seed zone. Rippled or fluted blades are available to suit a wide range of tillage and soil conditions. 1) Not compatible with tine tooth tillage, furrower attachments, V-wing bed sweep frame-mounted coulter or unit-mounted row cleaner. 2) Ballast attachment (or fertilizer attachment) may be required for penetration. 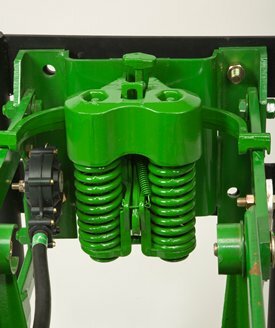 3) BA28970 or BA28971, heavy-duty adjustable downforce springs or pneumatic downforce system, are required to provide increased coulter penetration in hard soils and also to help keep unit from bouncing when being operated on rough seedbeds. (Not included with BA30078). 4) Requires A52092 cast heavy-duty lower regular parallel arm (one row) or A84382 heavy-duty lower long parallel arm (one row) from Service Parts. Heavy-duty long parallel arm is designed for use only with the unit-mounted coulter (not for tillage tool support bracket). Cast lower parallel arms have been standard equipment for a number of years, confirm what lower parallel arm subject planter is equipped with. The ComputerTrak 350 monitors use electronic circuitry, radar distance measuring, and a large liquid crystal display to provide sophisticated monitoring with simple operation. Along with this, the ComputerTrak 350 can monitor up to 32 rows simultaneously. 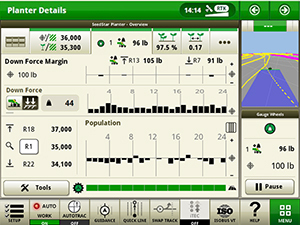 All other planter configurations will only have SeedStar™ 2 monitoring system available with no option for the ComputerTrak 350 monitoring system. Console is easy to program for special planting patterns such as skip rows, etc. NOTE: ComputerTrak 350 monitors require a radar input. Radar is ordered separately from monitor. 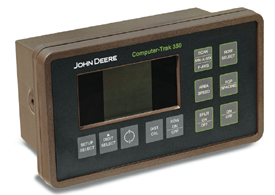 In the event of a radar or radar input failure, the ComputerTrak 350 monitor has the capability to continue with the monitoring of seed flow. If a disk-failed message occurs on this monitor, a set speed, or known as speed-set mode, can be entered to allow continued operation until the radar or radar input error has been resolved. When in speed-set mode, fast average, area, and speed readouts will not be available. Row-failed messages will occur when seed count drop below two seeds per second. High- and low-population warning messages are also deactivated in this mode. Also while in speed-set mode, the monitor is going to show fluctuating populations because it assumes the machine is traveling at a constant speed, even though actual populations may remain accurate at slower and faster speeds. Displayed population will only be close to actual populations when actual ground speed matches set speed. Hold the split on/off switch while turning monitor on. A full display screen will be displayed for a few seconds and then the row-failed screen will display. Release the split on/off switch and press the setup-select switch. The speed screen will be the first displayed. The speed will be displayed in the lower right-hand corner of the display. Use the digit select and 0-9 switches to enter expected planting speed. Press the scan switch to being monitoring of seed flow. If power is lost to monitor for any reason, hold the split on/off switch for one second while powering monitor on to re-enter speed-set mode. Previously entered speed is stored in memory and will not have to be re-entered. NOTE: The speed-set mode is deactivated each time monitor is powered off.